No 1 in A Major 28'53"
No 4 in F major 22'29"
No 5 in E Minor 22'58"
No 2 in A Minor 22'11"
No 3 in G Minor 19'58"
No 6 in D Minor 34'27"
This double CD of Bach's English Suites is another of the large number of discs being released to mark the 250th Anniversary of the composer's death. It is from Classico - a Continental label relatively new to me but which appears to try hard to produce a quality item and that gives the feeling that here is a company that regards presentation as important - if only it were so with all Labels. The notes are comprehensive and in English. There are a number of good recordings of the Suites, available on both piano and harpsichord. The soloist on this recording is the Sicilian Antonio Piricone. In his own notes with the disc he explains that he chooses to play a piano rather than, for instance, a harpsichord, to explore the modern instrument's possibilities so long as he does not forget the harpsichord technique and style for which the pieces were written. He quite deliberately uses a restricted range of dynamics and compensates for this by technical devices rather than using the keyboard as a showpiece. The result is clearly what the performer intends, and as a listener, I liked the results. From the opening bars of the first item, the prelude of the A Major Suite, reminders of the harpsichord were there and this middle-ground effect pleased. 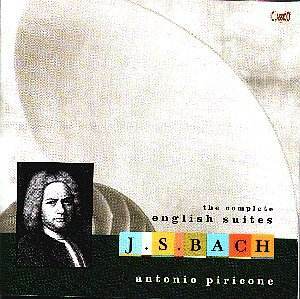 The Six Suites - the "English" allusion coming from the existence of a score that J.C. Bach (J.S.B. 's youngest son) had that described the pieces as "made for the English". Each opens with a prelude followed by various dances with different tempi and variations. Piricone gives a finely articulated performance, and avoids over rigidity with his rhythmic subtlety. Among the delights noted were the introspective Sarabande in the A Major Suite, the chirpy Courante of the F Major with its slightly uneven metre, the contrapuntal Prelude that opens No 5 in E Minor and the haunting Allemande that follows. A quick-fire Bourrée I and a lively Gigue, both in the E Minor Suite, another lingering Sarabande (the G Minor) and the lengthy Prelude to the D Minor also stood out in this attractive recording. This a not a pair of discs to sit down and listen to from beginning to end - but dipping into them as listeners probably would - will be a rewarding experience. The recording is excellent. Highly recommended.